There has always been a fascination for the pigeon gun. This was borne out of seeking an advantage against your competitors at live pigeon shooting – usually their was a lot of money at stake! To shoot fast and get a good sight picture, a broad, higher than normal matted flat top rib was the order of the day. This enabled the shooter to shoot high, as the bird was always rising out of the trap. Of course to guarantee a kill within the perimeter fence, full choke would often be used. Bigger cartridges and more pellets meant 2 3/4″ or 3″ heavy loads were used. 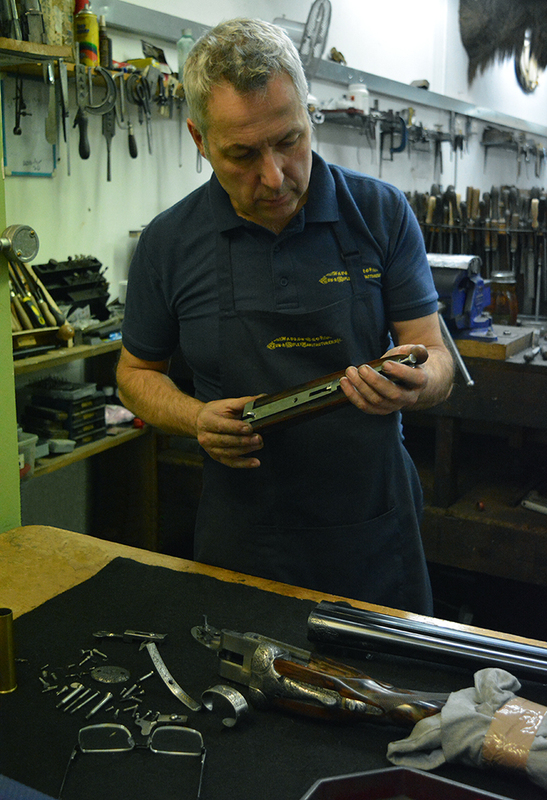 To make the gun strong enough, sideclips and a third grip were required on the action. With all this came the need for more weight. 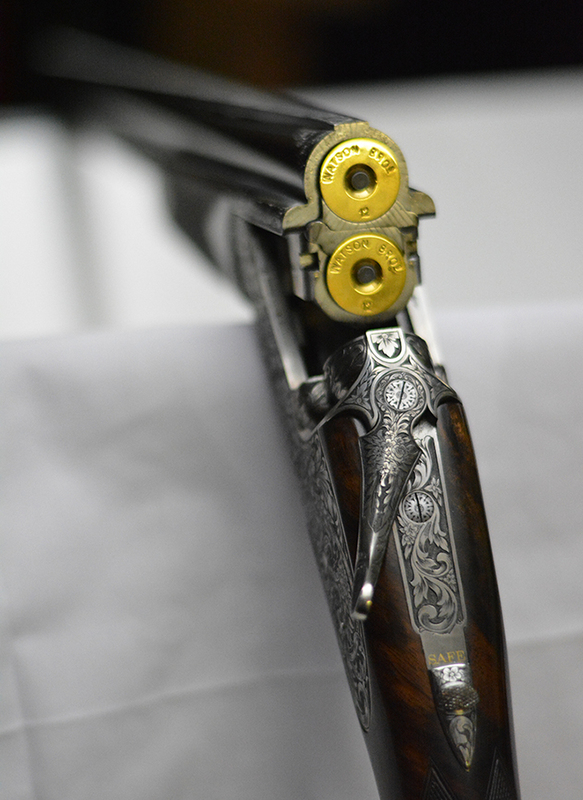 You can expect a side by side pigeon gun to be in excess of 7 1/4lb to give a stable platform for the shooter. 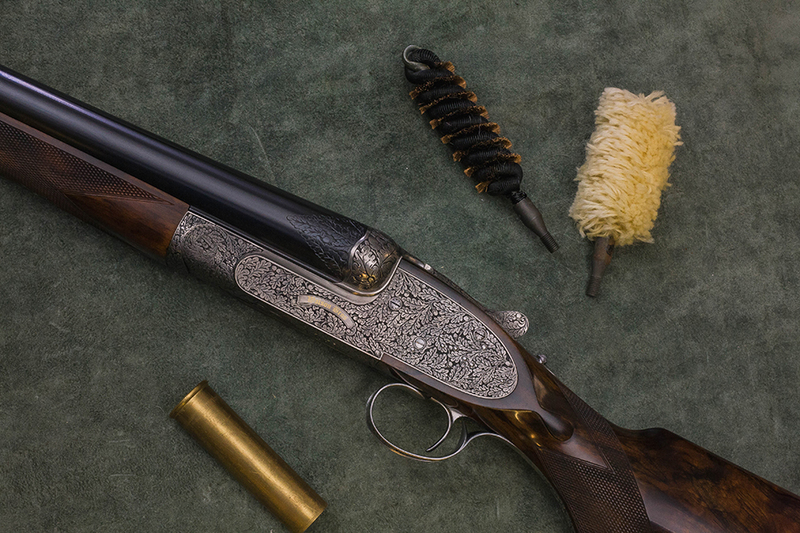 Nowadays, the pigeon gun has seen a resurgence as a high bird gun. They share the same characteristics in the field, but the pigeon gun has developed into being more than just a heavy breeched, heavy load gun. Today’s pigeon gun has to have a certain style. Stock to be pistol grip with long beaver tail forend and probably adorned with heel and toe pieces. 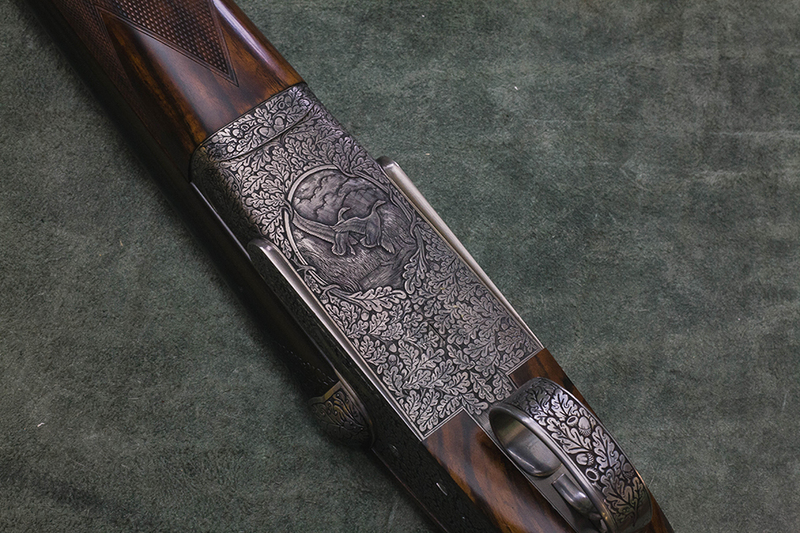 Some are auto safety, and are generally carved breechends with heavy engraving. Complemented with a deluxe case with canvas outer. 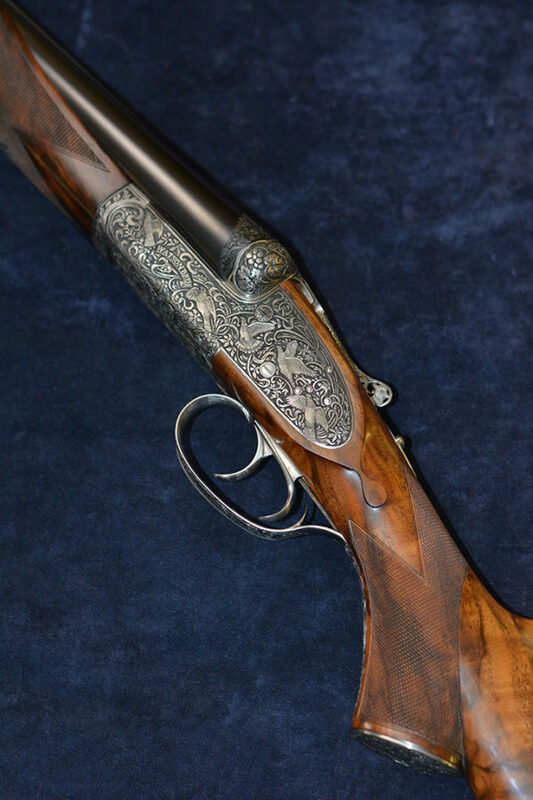 Watson are truly bespoke gunmakers as can be seen with this gun designed and made for those high bird days. 32″ barrels with 3″ chambers , full choke with an elevated ventilated rib. What adds to the uniqueness of this gun is it is true left handed with left handed opening , round body single trigger. As ever the 15 1/2″ stock is made from ultra deluxe walnut. 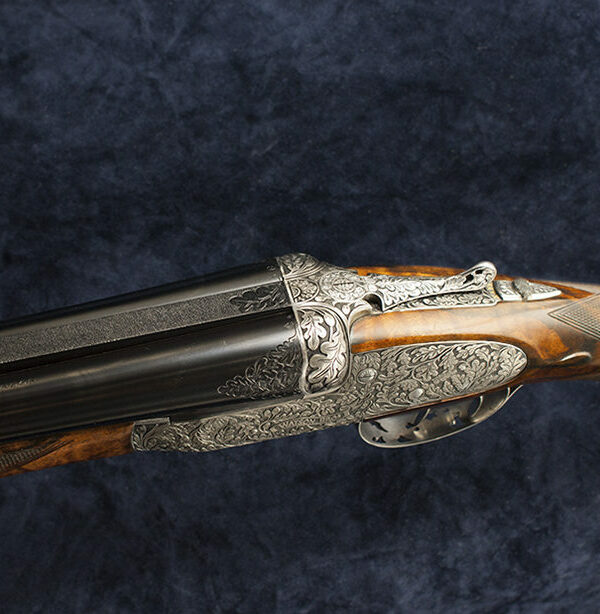 Adorned with our Edwardian scroll and carved pheasant with the lovely touch of raised lettering. The gun weight is 8lb as to be expected with these heavy loads. This is the only correctly proportioned four bore being manufactured in England today. Made in our Tower Bridge workshop, and designed by Michael Louca. Guncase is an extra cost, dependant on the type of case required. All for the sum of £75,000 plus taxes.